What Is the Hog's Head? The Hog's Head is a quick service bar with alcoholic and non-alcoholic drinks. In the Harry Potter books, the Hog's Head is described as a "small, dingy pub." This description clearly inspired the look of the Hog's Head in the theme park, which is also small and dimly lit. We consider the Hog's Head a must visit for Harry Potter fans, who will love the atmosphere and the attention to detail. Other guests will appreciate having a place to sit and take a break - there aren't many spots to do that in Hogsmeade. If you sit indoors, the dim lighting in the Hog's Head provides a nice break from the Florida sun. If you would rather sit outdoors, you should head to the back patio where you'll have a nice view of Hogwarts. The Three Broomsticks in The Wizarding World of Harry Potter - Hogsmeade. The Hog's Head is located in The Wizarding World of Harry Potter - Hogsmeade in Islands of Adventure. On the outside, there is a green sign adorned with a picture of a hog's head. You can access this pub through Three Broomsticks, another Harry Potter themed quick service location. The Hog's Head doesn't serve food, but you can order a lot of different Harry Potter themed drinks. In fact, this is the place to go in Hogsmeade if you want to sit, relax, and sip your beverages. 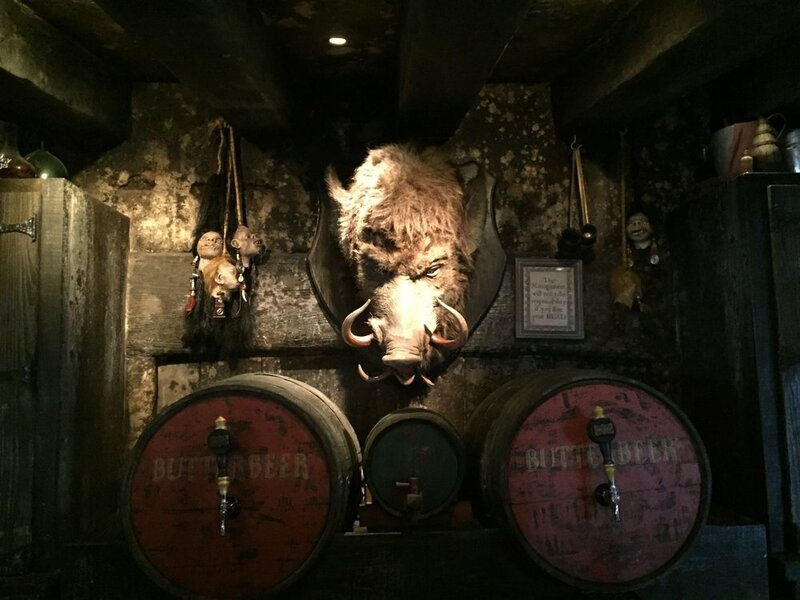 The Hog's Head menu has non-alcoholic drinks like Butterbeer, Pumpkin Juice, and Gillywater. You can also get themed beers brewed by Florida Beer Company specifically for The Wizarding World of Harry Potter. You can purchase your drinks in a souvenir mug at the Hog's Head. The hours at the Hog's Head vary depending on when the park opens and closes. However, if the park is open, the Hog's Head is usually open too. You cannot make reservations for the Hog's Head. If you ask your bartender about specialty mixes, you can get mixed beers and drinks that aren't on the menu (such as The Hog's Bite, which is Strongbow Cider topped with Hog's Head Brew). The hog's head that hangs behind the bar at the Hog's Head makes snarling noises. If you listen carefully, you can sometimes hear the sound of footsteps above you. This is presumably the inn's unseen patrons wandering around the upstairs portion of the building. The hog's head behind the bar at the Hog's Head. In the Harry Potter books and movies, the Hog's Head Inn and Pub is owned and operated by Aberforth Dumbledore, the younger brother of Albus Dumbledore. The name of the Hog's Head Inn and Pub comes from the term hogshead, which is a measurement used for alcoholic beverages like ale and wine. A hogshead is equal to 63 gallons of wine of 64 gallons of beer. In the Harry Potter books and movies, there is a secret tunnel that connects the Hog's Head Inn and Pub to the Hogwarts School of Witchcraft and Wizardry. This image gallery features pictures of the inside and outside of the Hog's Head, including pictures of themed taps behind the bar.